Qatar 2022 World Cup organisers say they are "appalled" by the findings of an investigation into the treatment of migrant workers in the country. The Guardian reported Nepalese workers in Qatar "face exploitation and abuses that amount to modern-day slavery". 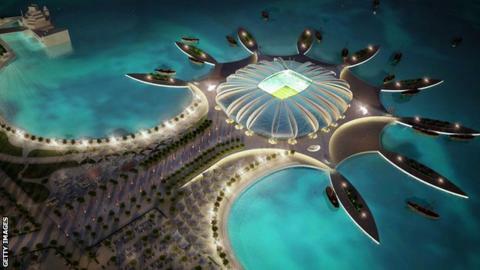 Tournament organisers says the Qatari government will study the allegations, while Fifa says it is "very concerned". A Qatari statement read: "There is no excuse for any worker in Qatar to be treated in this manner." The statement from World Cup organisers continued: "The health, safety, well-being and dignity of every worker that contributes to staging the 2022 Fifa World Cup is of the utmost importance to our committee and we are committed to ensuring that the event serves as a catalyst toward creating sustainable improvements to the lives of all workers in Qatar." Qatari officials are adamant that working conditions will be suitable for those involved in construction of World Cup facilities. The statement added: "We firmly believe that all workers engaged on our projects, and those of the other infrastructure developers in Qatar, have a right to be treated in a manner that ensures at all times their wellbeing, safety, security, and dignity. BBC Radio 5 live spoke to the chief executive of Qatar 2022, Hassan Al Thawadi earlier this month, before the Guardian's findings were published. Asked about the issue of working conditions, he said: "Our priority when it comes to the workers is to ensure the safety, security, dignity and health of each worker is catered for and taken care of." He added that work on World Cup projects had yet to get under way, but when it did contractors would have to abide by a "workers' charter". "We've shared these workers' standards and our workers' strategy with Human Rights Watch and Amnesty International and we are in open discussions with them as well," he added. The 2022 World Cup is already under scrutiny because of concerns about the effects Qatar's searing summer heat could have on players. A Fifa statement said world football's governing body "will again get in contact with the Qatari authorities". Fifa's executive committee will discuss the issue when it meets in Zurich on 3-4 October to discuss the possibility of moving the competition to winter.